At the beginning of the 80s, a new bass synth appeared on the market. Aimed at bass-guitarists, it featured an in-built sequencer with slides and accents. Only about a decade later did it become one of the most popular instruments in certain styles of acid, techno, house and trance music. Since that, numerous copies and software and hardware emulations have been born, which all try to grasp the character of this wonderful synth. We did our best to reincarnate this instrument as an authentic-sounding, convenient and easy-to-use VSTi plugin. Countless hours were spent on analysis and measurements, with the goal of making the most-authentic sounding emulation. As a result of the research, SilverBox was born, 25 years after the creation of the machine. For more information about available features, please visit the FAQ page. SilverBox is an authentic digital emulation of the world's most renowned and famous analog bass line machine. It's square oscillator accurately models the oscillator of this 80s analog beast, giving a spectrally different square wave for different notes. The in-built sequencer has the traditional behaviour with accents and slides. The accent circuit is probably the most difficult to faithfully reproduce virtually, and most other emulations simply fail to reproduce the typical barking sound. Most emphasis was on creating the best accent emulation possible, because no virtual plugin fulfilled our expectations. The same applies to the filter - most other emulators don't reproduce the typical resonance character thoroughout the entire frequency range at all. The most striking difference with SilverBox and most other emulators (besides sound) is the ease of use. You see the entire pattern instantly, no need to cycle through steps to see what's going on in the pattern. With dedicated rows for gate, up, down, accent and slide, you can alter patterns easily and quickly. The piano roll gives you an overview of the melody in a familiar way. The pattern functions give you an intuitive way of quickly and easily delete, shift, or randomize rows independently. The random functions allow you to set a random probability for each row, which allows you to create many similar random patterns at a click of button. 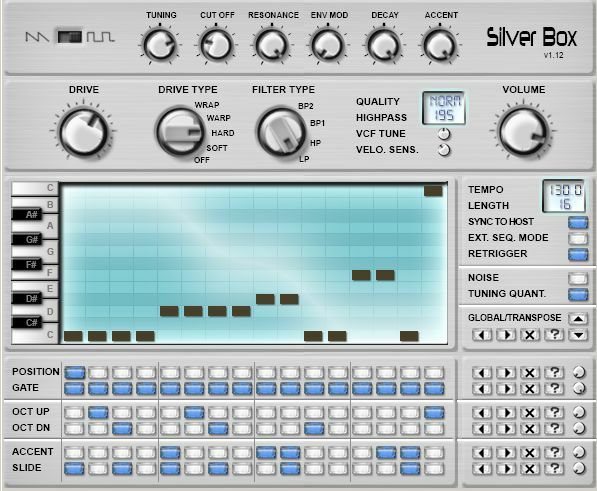 Unlike the original which is difficult to program, SilverBox is really easy and fun to use. "It is one of the most user friendly instruments these days and this makes SilverBox proudly stand out amongst others." The second most important aspect was the sound quality. SilverBox uses oversampling where necessary, to minimize annoying high-frequency aliasing artifacts at internal distortion, typical with virtual instruments. With its sophisticated 16x oversampled in-built distortion engine, SilverBox can drive your basslines with an amazing +80 dB into four types of saturation, with nearly no digital aliasing artifacts. That means, if your host runs at 44.1 kHz, then SilverBox processes sound internally at 705.6 kHz! "Silverbox sounds amazingly good. It definitely has the 303 sound and it doesn't sound artificial like some virtual instruments do." Despite the extreme oversampling, SilverBox runs lightning fast on your SSE-enabled processor. Designed to utilize modern CPUs' efficient instruction sets, SilverBox processes 4 samples at once! This gives you a lightweight plug-in which allows you more instances, and leaves you more horsepower for the rest. In addition to the standard features, SilverBox has a bunch of extras as well. There are additional four unique filter modes with bandpass, highpass and peak responses, at the same time retaining the typical resonance character. The MIDI out feature allows you to drive another software of hardware synth with the SilverBox internal sequencer. And the noise feature adds some hiss, to make the sound less digital and sterile. Here are some sound samples which compare the sound of the original Bass Line to SilverBox. To hear more sound samples, please use the player at the right side of the page, or listen to the following demo tracks. Note that the demo sound player requires Macromedia Flash. All samples and demos were recorded at 44.1 kHz sampling rate. You can listen these demo tracks using the demo sound player on the right side of the page. They are listed at the end of the playlist. The sound drops out every 45 seconds. The number of presets is limited to 16. The installer doesn't create any additional files, folders or registry entries; just copies the files to the location you specified. SilverBox doesn't give any sound until it receives MIDI input from the VST host, so you need to add some notes in your sequncer or press a key on your MIDI keyboard in order to hear sound. Before purchasing, please make sure the demo runs fine on your computer. After the purchase, the download link to the full version and the serial will be sent to your email address usually within 1 day. Updates will be sent to your PayPal email address. If you want to receive updates to a different address, please tell us! If you don't receive the download link within 1 day, please check your spam/bulk/junk folder! You can avoid this by adding our mailing address (found on the contact page) to the list of "safe" email addresses. If you have any questions about payment, please do not hesitate to contact us. Added: automation for all individual steps in the sequencer. So now you can automate gate, up, down, accent, slide and pitch steps in the pattern. Improved nonlinear filter, giving you warmer analog sound. Fixed a bug in the Tuning knob. Tuning quantize now works correctly. Now all knobs including the Tuning knob are vertical linear. For fine tuning, hold the Control key. SilverBox can now be played from an external host! "I've just had a short play with the demo in Minihost and I am super impressed with both the sound and the sequencing behaviour. Definitely an inspirational instrument. [...] I will play with it more tomorrow but so far it's smooth and great sounding ! Well done on nailing THAT sound !" "Silverbox is just THE plugin I've been waiting for a long time. I love it because it is a complete 303 setup with distortion and different filter types. It's so damn easy to program sequences and slides in the matrix. Great!" "You have a really great 303 box here. Just played with it a bit and it brings back fond memories of d-lusion RubberDuck ;-) Great sound quality and so much fun to play with." "Silverbox sounds amazingly good. It definitely has the 303 sound and it doesn't sound artificial like some virtual instruments do. It has this recognizable 303 sound - from a depth and punch to the 'teen and smirk' - like high snarling sound." "SilverBox is so fantastic! It's very easy to program the sequencer, including accent, gate and all the parameters. And it's 100% real time readable/writeable within your host sequencer through automation." "Wow! SilverBox is freaking dope. This is the elusive sound I've been looking for since first trying rubberduck so long ago. I fake it with Monobass and Tube Distortion in Orion but this sounds 100x more real. Crazy cool job on this plug man. SE + C++ + ASM = awesome. Cant wait to see what you come up with next." "Silverbox is an awesome plug-in. Its 303 emulation is excellent, and the enhancements, especially the piano roll sequencer give it something to offer someone who owns another 303 emulation. I really like the distortion unit as well." "Just checked it out and the sound authenticity is mere fantastics! CPU performance is brilliant. Very nice distortions. Kewl random functions." "Just bought this via paypal. Must say 10 out of 10 thumbs up for your work. Never used a VST 303 emulator to such a high standard and likeness. Its rare I get my wallet out but this well worth the money." © 2007-2009 Spectralhead Audio. All rights reserved.